Terri's Little Haven is having a Mother’s Day Giveaway! 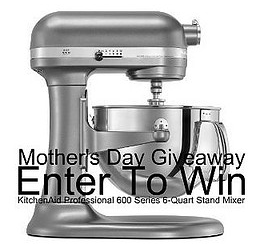 The prize is an awesome Kitchen Aid Mixer! Terri wants it to be a fun and simple to signup for the giveaway, so there will only be one link per person (Google +). If you need G+ followers this is your chance. If you’ve never hosted a giveaway and want to learn how, this would be a good place to start (because basically Terri is doing everything for you, you just copy and paste it in a post). Stop over to Terri's Little Haven and sign up for this Mother's Day Giveaway. I'm so glad you are participating in this. I just love Kitchen Aid Mixers.